Technology is a disruptive force – enabling new business models, opening new sources of revenue and shaping entire industry landscapes. It is not surprising that discussions about digital transformation have dominated conversations amongst the C-suite, in the boardrooms, and even governments. However, one of the biggest challenges in digital transformation is ensuring security, privacy, and compliance. The recent high-profile breaches have made it very clear that organizations face the risk of significant financial loss, damage to customer satisfaction and market reputation. Given this, a critical priority for IT leaders and business decision makers is to secure corporate data and manage risk while taking advantage of the opportunities presented by today’s mobile-first, cloud-first world. A Frost & Sullivan study commissioned by Microsoft revealed that the potential economic loss across Asia Pacific due to cybersecurity breaches can hit a staggering US$1.745 trillion — more than 7% of the region’s total GDP of US$24.33 trillion. The study, titled “Understanding the Cybersecurity Threat Landscape in Asia Pacific: Securing the Modern Enterprise in a Digital World”, aims to provide business and IT decision makers with insights on the economic cost of cybersecurity breaches in the region and identify the gaps in organizations’ cybersecurity strategies. The study involved a survey of 1,300 business and IT decision makers ranging from mid-sized organizations (250 to 499 employees) to large-sized organizations (>than 500 employees). All respondents are involved in shaping their organizations’ cybersecurity strategies. The healthcare vertical findings from the Understanding the Cybersecurity Threat Landscape in Asia Pacific: Securing the Modern Enterprise in a Digital World study found that a cyberattack incident can cost a large healthcare organization in Asia Pacific an average of US$23.3 million in economic loss. For mid-sized healthcare organizations, the average economic loss was US$17,000. The study further revealed the highest economic impact of cybercrime was loss of customers and three out of five (60%) cybersecurity attacks against healthcare organizations over the last 12 months have resulted in job losses across different functions. 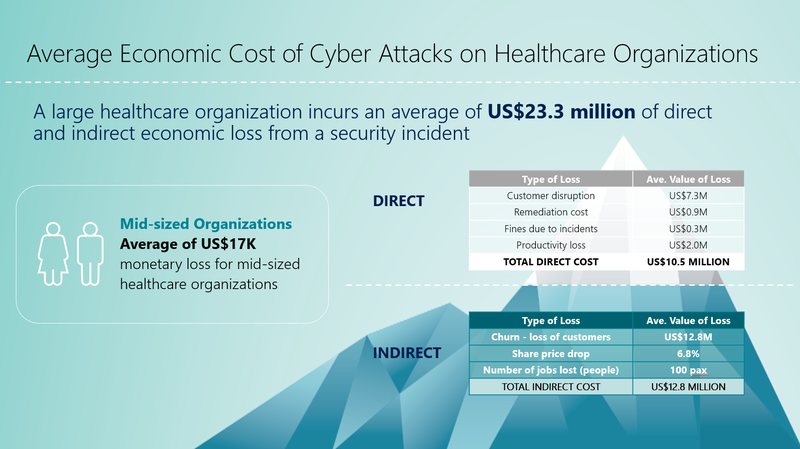 A breakdown of the average direct and indirect economic cost that a large healthcare organization can incur due to a cybersecurity incident. To meet patients’ growing expectations and needs, healthcare organizations today need to digitally transform themselves to empower care teams, optimize clinical effectiveness, and reinvent the care continuum. Keren Priyadarshini, Regional Business Lead, Worldwide Health, Microsoft Asia, elaborates on the cyber risks that healthcare organizations face and the key considerations they can look at while integrating cybersecurity into all its digital processes. As retailers go digital, they are collecting more personal and financial data about their customers than ever before. This makes them increasingly attractive targets for cybercriminals. Raj Raguneethan, Asia Lead, Retail and Consumer Industries at Microsoft, explains why cybersecurity and trust are key to creating a safe, secure and seamless buying experience for their customers. Cybercriminals have never been more organized, smart, and potent. And yet, many businesses in Asia Pacific are exposing themselves to massive risks by skipping regular cybersecurity assessments of their digital environment. Mary Jo Schrade, Assistant General Counsel & Regional Director, Digital Crimes Unit, Microsoft Asia identifies the key cyber risks plaguing organizations today and explains how they can strengthen their cybersecurity posture. Like the iceberg which sank the mighty Titanic, cyberattacks can be vastly bigger than what most leaders can imagine. Eric Lam, Director, Enterprise Cybersecurity Group, Microsoft Asia argues that it is almost impossible for organizations to avoid hitting ‘icebergs’ in this digital world. In this byline, Eric shares insights into how to build organizations resilient to cyberattacks. A 3-minute quick read of the key findings and recommendations from the study. Learn about the latest cyberthreats to make sure your company’s security keeps up with the evolving threat landscape. The Microsoft Security Intelligence Report Volume 23 analyzes key security trends from the past year—and provides actionable recommendations on how you can respond today. Botnets. These impact millions of machines globally and infect them with old and new forms of malware. Read about one highly publicized botnet disruption, Gamarue, that Microsoft helped defeat. Attacker methods. Attackers have been using low friction methods to infiltrate organizations. Learn about the approaches they’re using to take advantage of weaknesses in organizations. Ransomware. Three global outbreaks affected corporate networks, bringing down critical services. The impact from these rapid, destructive attacks was unprecedented in 2017. Revisit the announcements made at RSA 2018 in San Francisco, where Microsoft unveiled new offerings to take security more squarely to where it needs to go and where it has not effectively gone before – the edge. While the rapid advancement of AI is unlocking boundless benefits across every field of human endeavor, it is also raising complex and critical questions around privacy, transparency and trust. Microsoft Asia President Ralph Haupter shares why designing a trustworthy AI is vital and the ethical principles that should be at the heart of any AI-powered solutions and deployment. Artificial intelligence could soon reset the murky world of cybercrime – and the news is both good and bad. Ann Johnson, Microsoft’s Vice President, Enterprise & Cybersecurity talks about why she thinks it is inevitable that the criminal use of AI will result in more sophisticated threats, and why she is also optimistic that companies and crimefighters, armed with AI, will be able to catch threats faster, and use analytics to predict when something is going to happen. This relic from the early days of computing has long outlived its usefulness, and certainly, its ability to keep criminals at bay. More than two-thirds of people use the same, usually not-very-strong password across dozens of different accounts. Microsoft sees a better way forward. Through intelligence, innovation and partnerships, the company is helping to drive an industry-wide shift beyond passwords. Ralph Haupter, President, Microsoft Asia shares why ‘complacency’ is the biggest cyber threat to businesses in Asia, pinpointing bad habits and lack of safety procedures as key reasons to allowing cyber criminals to breach a system with little effort, even if a company has invested heavily in security technology. Pirated software. Okay, it’s not the real thing, but it is cheap. And, that’s tempting, right? Well, listen to Biplab Sikdar of the National University of Singapore (NUS). He has three words of expert advice: “Don’t do it!” People, he explains, may think they are getting a bargain when in fact they are buying trouble, and possibly big trouble.